AFC Bournemouth youngster Nnamdi Ofoborh made his debut for the Flying Eagles. 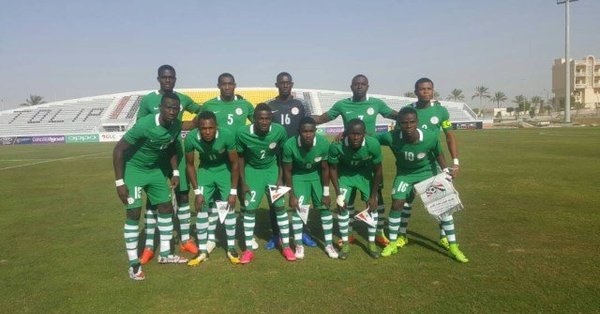 Less than 24 hours after the Super Eagles were humbled in their friendly game against Serbia, the Nigeria U20 boys’ team, the Flying Eagles, were also beaten 2-1 today by their Egyptian counterparts. The first leg of the friendlies had ended in a goalless draw on Monday. Both teams are preparing for U20 AFCON qualifiers in May. Egypt opened scoring in the first half, before they doubled their advantage after the interval. However, Plateau United defender Mike Zaruma reduced the tally for the Flying Eagles late in the encounter courtesy of a 40-yard scorcher. The Flying Eagles are due back in the country on Thursday, and will play the winner of the Sierra Leone, Guinea Bissau preliminary fixture in the first round of the 2019 Africa U20 Cup of Nations qualifiers in May.